It’s important to have good beer for this because one of your obstacles in gluten-free cooking is the fact that rice doesn’t stick. It doesn’t have gluten. Yeast and malt can compensate for all that non-stickiness, though. Hence, the expensive beer. 1 1/2 cups regular rice flour, either Kokohu Rose or Kinnikinnick–it’s not sweet rice flour. Chill the beer for at least thirty minutes, or in my case, just take it out of the back of the refrigerator. It’s really important that it be cold. In fact, all of your ingredients will fry better if they’re cold. Put the hake into the microwave and thaw, using the thaw setting, until the fish is only halfway thawed. The fish should be pliable enough to cut into pieces, but not warm. Measure three cups of canola oil into a deep fat fryer. Turn on the deep fat fryer to about 360. Pour the beer into a mixing bowl. Measure out the rice flour into the beer and mix well. Take the fish out of the microwave and cut into palm sized pieces. Divide the fish into two batches. Working rapidly with one batch at a time, spoon batter onto the fish, coating both sides. (The goal here is to be fast, so you keep it all cold.) With a spoon or spatula, lower half of the pieces of hake into the batter. Cook about five to eight minutes, until golden brown. Line a plate with paper towels to drain the fish and carefully remove it with a spatula or slotted spoon. Repeat. While the second batch of fish is cooking, rinse and scrub three large Yukon gold potatoes. Cut into wedges. Remove the last batch of fish from the deep fat fryer. Turn up the heat on the deep fat fryer a little, to about 375. Separate the potato wedges into three batches. One batch at a time, fry each batch for only five to six minutes–french fries are surprisingly easy to overcook. Be sure to use utensils to put the potatoes in the boiling oil; at this temperature, it will splash and burn way too easily. Finally, take out the last batch of fries and let everything cool for at least twenty minutes: right out of the fryer all of this is the temperature of the interior of Jupiter. Admire your handiwork. Inhale. 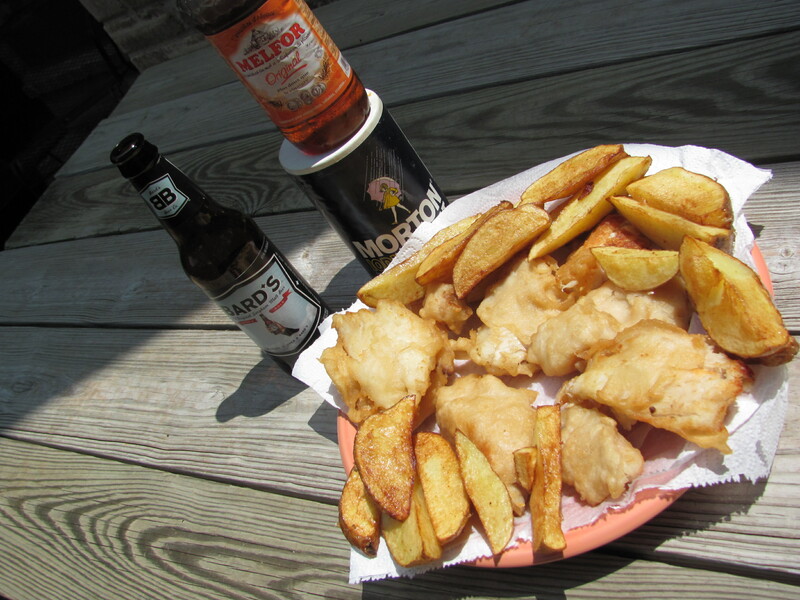 Your whole house now smells like fish and chips. Is it possible that Red Bridge (the other gluten-free beer) would work as well? Mmmmm… red bridge. It’s not the alcohol. Gluten gives gluten sensitive people a headache. You can use sweet rice flour if the sweeter taste is o.k. in that recipe. It IS gluten-free if it’s made by someone like Koda farms who uses the wet-milling process. They sell sweet rice marked “mochiko”, and that is gluten-free, because rice is all they have in the plant, so there is no cross-contamination. As far as the cornmeal goes–yikes, that’s a tough one. If it’s milled in a larger mill, it’s not gf because of cross-contamination; if Bob’s Red Mill makes it, it’s not gf even if it says gf on the box because they process oats in their gluten-free plant. You could, though use Argo cornstarch, maybe? It’s gluten-free, and always has been, because, again, that’s all they make, so there is no danger of cross-contamination.